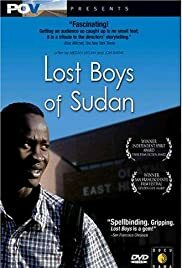 Well made documentary focusing on two Sudanese refugees who get resettled in the United States. It's your basic fish out of water story with a non-fiction twist. I found it fascinating to see how Peter and Santino lived prior to coming to America and how they adapted once they arrived here (in Houston, Texas.) They expected a sort of heaven but found out that it's a lot harder than it looks to cope well in the states. They go from hopeful idealists to somewhat more realistic skeptics. Everywhere they go they meet bureaucrats with paper trails that most citizens may take for granted. They fret that they are blacker than the African-Americans here and don't feel accepted because of that. One of the "Lost Boys" manages to leave Houston to go to Olathe, Kansas, where he finds conditions slightly better but still less than ideal. There are people that try to help them as well as try to hurt them in this film. Not shown, but talked about, are those who put a gun to their heads and robbed them, leading one Lost Boy to comment negatively that "all black people in America are no good." I found it interesting, too, that they arrived in Houston in August 2001, a month before the World Trade Center was attacked by terrorists. I had hoped to see their reaction to this tragedy but it's not mentioned at all. Still, all in all, a really well done documentary with no narration. None is needed really. The "Lost Boys" do a fine job expounding on the events going on around them without any help at all, thank you very much.